[UPDATED 2:07 p.m.] State Route 155 is closed between Nespelem and Omak again as the Tunk Block Fire approaches the highway, a Friday report from Colville Tribal Emergency Services said. And Okanogan County Emergency Management announced new Level 3 (immediate) evacuations for the north, middle and south forks of Gold Creek, Gold Creek Road Loop Road due to rapidly advancing fire, with instructions to evacuate to SR 153 to Twisp or Pateros. Also, a level 3 evacuation order has been issued for Highway 21 south of Highway 20 to include the following roads: Country Place, Marblemount Place, Adams Road, Penny Lane, Eagle Track Road, and Pendry Road. Fire and law enforcement personnel are working in this area to provide specific information of the route(s) to take. A Red Cross evacuation center is available at Grace Evangelical Church, 851 S. Miner Street in Colville. Highway 21 is still closed from Bridge Creek to McMann Creek. The North Star Fire has burned nearly 193,000 acres. Location: Approximately 12 miles north of Nespelem, WA. Republic Elementary School, 30306 East Hwy 20 Republic, WA 99166. Today's Actions: Crews will continue to focus on structure protection in Republic, Nespelem and communities along the Highway 21 corridor. Fire operations on the west side of the fire will be concentrated on structure protection and support in the Moses Meadows area. Dozer and containment lines are continuing to be implemented and reinforced to help in the fires containment. If weather conditions are favorable, burn-out operations will continue in the Aeneas Valley and areas south of Republic. Once visibility improves, helicopter water bucket operations will resume. A Community meeting will be held in Republic this afternoon. Yesterday's Actions: Extreme fire behavior was exhibited throughout the 149.5 mile perimeter of the fire. Dozer lines were constructed and preparation for future burn-out operations continued in the Aeneas Valley, along Highway 21 and areas south of Republic, enhancing structure protection for the area. The area along Highway 21 from Cache Creek north to South Nanamkin Creek was put on a Level II evacuation notice. Crews back-burned around structures in the Moses Meadow area. Type 1 helicopters continuously delivered water drops in support of ground crews. International firefighters from Australia arrived to help with the firefighting efforts. The Tunk Block Fire burned intensely, sending up columns of smoke and closing Highway 155 between Omak and Nespelem. Stage 3 evacuations for Copper Lakes/Copper Mountain Area, Mikray Place, Mule Deer Road, White Tail Flats Road, Roby Ridge Road, Eddy Road, and Swan Lake Road south of Republic. Stage 3 evacuations are still in effect for residents in Moses Meadows Community, Haden Creek, including Owhi Flats, Disautel, along Highway 155, all of Aeneas Valley and West Fork. CLOSURES: Highway 155 is closed from Nespelem to Omak, due to Tunk Block Fire activity. 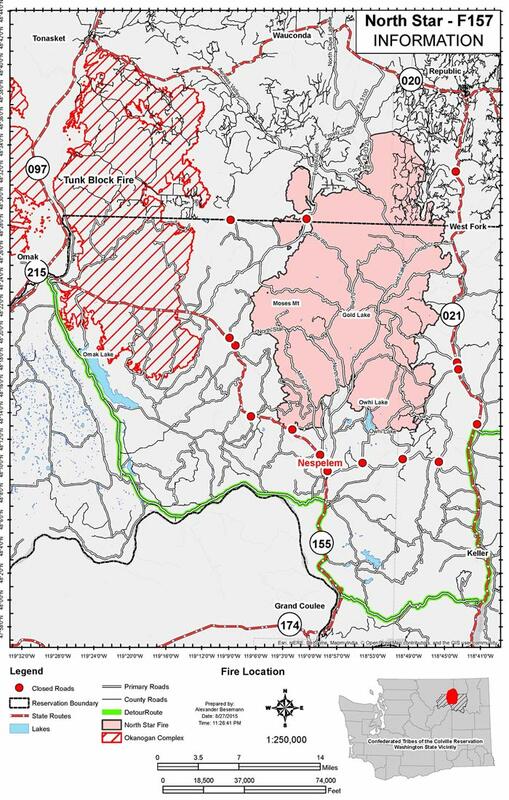 Okanogan – Wenatchee National Forests closure east of Tonasket and south of highway 20. Highway 21 from Bridge Creek Road north to the Reservation boundary is closed. Colville Indian Reservation forest and recreational areas are closed to the public due to extreme fire danger.